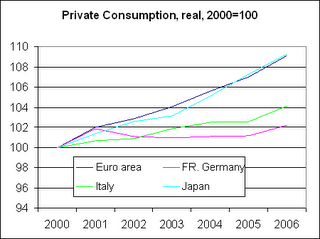 Following a short debate in comments on this post, Sebastian Dullien of Eurozone Watch blog mailed me the following chart for private consumption 2000 - 2006 for Germany, Japan, Italy and the Eurozone. Curiously Japanese consumption (which is far from strong) is near the eurozone average (which of course incorporates Italy and Germany). As Sebastian notes (see below) "consumption growth in Germany since 2000 has been less than a fourth of that in Japan and only half of that in Italy". Clearly there are more factors than simply the demographic ones at work here (latent German pessimism? ), but all of this is certainly taking the debate into the right ballpark. You might be right that demographics plays a role in the consumption behaviour – something you can see also when looking at individual cases. This is indeed a very important issue, which has largely been neglected. However, it seems to me that consumption in Germany has been much weaker than what can be explained by demographics alone. You quote yourself statistics that the median age in Italy, Germany and Japan are about the same. However, consumption growth in Germany since 2000 has been less than a fourth of that in Japan and only half of that in Italy (data from EU commission) In order to get a decent growth performance, Germany does not need a consumption growth in the magnitude of that of the US, but if our consumption had grown with the same speed as Japan’s, without any multiplier effects, average GDP growth over the past six years would have been 0.6 percentage points higher. Incidentally Sebastian, I don't think the issue of graphs in comments is a question of your knowledge. 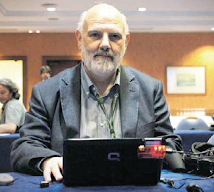 My impression is that blog hasn't quite got there yet, but doubtless it will come. Thanks all the same. Here is a link to a working paper titled "Is Germany Turning Japanese?" I haven't had time to study it in depth, but it appears to address this issue and is clearly a relevant question.